TVS has finally relaunched the Victor motorcycle in India at an event held in Chennai on 20th January along with the much anticipated TVS Apache RTR 200 4V. A live webcast was also available on TVS Victor’s official website. TVS Victor made its debut back in 2001 when TVS launched its first indigenously developed motorcycle the Victor. It was on sale till the year 2007 when it was discontinued due to poor sales and cannibalization from the Star. 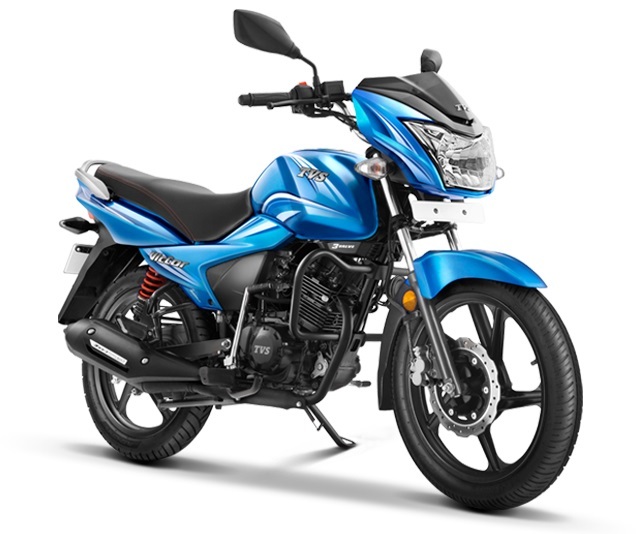 Now, the company has relaunched the motorcycle placing it slightly above the Star range of bikes in terms of pricing and features. The new Victor is available in six color options- Blue, Red, Silver, Grey, Black Red and Black Silver. It shares its mechanicals with the Star City+ but with a fresh unique design. The engine remains the same, a 109.7cc unit coupled with a 4-speed gearbox produces 9.5 BHP of power at 7500 RPM and 9.4 Nm of torque at 6000 RPM, as the Star City+ but it produces more power now. The low kerb weight of 113 kgs (Disc) and 112 kgs (Drum) helps in class leading acceleration. The front suspension is the regular telescopic oil damped front suspension unit seen on most commuter motorcycles whereas the rear one is a 5-step adjustable hydraulic spring suspension unit to provide good ride quality. The claimed fuel efficiency is 76 km/l and the tank capacity is 8-litres giving it an effective range of over 550 kms. The ground clearance is a healthy 175 mm keeping in mind the poor roads in most areas of our country. The headlight gets a 55 watt bulb which is claimed to be the brightest in the segment. In terms of features, the TVS Victor gets alloy wheels, drum brakes at the front and rear with an option of disc brake at the front, dual rear shock absorbers and LED tail-light. It also gets contrast stitching on the seat to give it a bit more appeal. With the launch of Victor, TVS aims at competing in the commuter motorcycle segment with established rival bikes like the Hero Splendor and the Honda Dream series.